The year was 1946. It was a hot, late summertime in Lexington, Kentucky, and tobacco was high as an elephant's eye. I was preparing for my junior year at Campion High School in Prairie du Chien, Wisconsin. I knew it would be cold there and I needed a new winter jacket, one that I could use for iceskating on the frozen sloughs of the Mississippi River and for skiing in the bluffs. So I went shopping in the heat for a winter jacket. Have you ever shopped for winter clothing in the middle of summer? Good luck. Everywhere I looked, in all the stores in downtown Lexington, all I could find were bathing suits and tee shirts. I made a deal with my brother-in-law, Herb, to find a suitable winter jacket after summer when the stores resumed selling warm clothes and mail it to me at school. Besides getting ready for school, I was vaguely aware of important things happening on the national scene. At the movies, the newsreels were full of stories about strikes taking place everywhere. 1946, it turns out, was a watershed for labor unions that had been striking in startling frequency since the end of World War II. The 1945-46 strike wave, which opened up at the close of World War II, was fueled by the aspirations of some 10-15 million returning veterans and the renewed demands of the unions which had been bottled up during four years of no-strike pledges and wage freezes. It took off almost immediately at the close of the war in August 1945. On January 24, 1946, the government seized packinghouses on the grounds that their strike was impeding the war effort months after the war's end and the strike was thus broken. The United Automobile Workers (CIO) ended a 30-month strike against General Motors Corp. by negotiating an hourly wage increase of 18 1/2 cents. The nation's railroads were seized by order of President Truman on May 17 to head off a nationwide strike. Workers struck anyway on May 23, and only the president's threat to draft the strikers and call up the Army to run the railroads forced them back to work. Many other strikes were taking place that year, but there was one set of strikes that had a bizarro effect on students at Campion where an unusually severe winter was approaching. On April 1, 1946, John L. Lewis, head of the United Mine Workers (UMW), called 400,000 bituminous coal miners out on strike for improved wages, health benefits, and safety regulations. By mid-May, the strike was crippling industrial production and threatened to end the economy's postwar recovery. When Lewis rejected President Harry S. Truman's efforts to find a compromise, the president, on May 21, seized the mines and ordered the strikers back to work. When the coal companies refused a settlement negotiated between the UMW workers and government, John L. Lewis took his men out of the pits on November 21. Upon refusing an injunction to resume work, a US judge found Lewis in contempt of court and fined the union $3,500,000 - later reduced to $700,000 - before Lewis ended the strike on December 7. In the fall of 1946, due to months of fuss in the coal industry, coal was in short supply everywhere in the country. Campion's regular supply of one coal car's worth was scheduled to be delivered by November 31 but it had never arrived. Now the central heating plant at Campion, which used coal to heat all the buildings built by 1922, was located in the northeast corner of the campus. The Burlington railroad tracks from Chicago ran along the eastern border of the campus. Every year a carload of coal was delivered to a siding that ran alongside the heating plant. So in early December, when the coal on hand was running low, the siding normally holding a full coal car stood vacant. The Jesuits were scratching their heads about what to do with 500 high school boys about to face some very cold conditions. In spite of frequent letters home pleading with my family to send me a winter jacket I never heard from Herb, my brother-in-law, who had promised to take care of my need when the stores began selling winter clothes. I was equipped with a couple of wool sweaters that I used around campus, but they were no match for the blistery winds that were sure to arise as we entered December and January. By the second week in December the decision was finally made, in light of the coal shortfall, to send the boys home early for Christmas. Surely the missing coal car would turn up in the next few weeks. I rode the train home to Kentucky eager for my extended Christmas vacation forgetting all about the coal shortage in Wisconsin. For the week before Christmas I worked at the U. S. Post Office in Lexington. My boss there was Mr. Wilkerson whom I had known as the scoutmaster at Troop 7. I worked in a small cubicle with about a hundred mail slots on the walls each labeled with the name of some small town in Kentucky. My job was to sort cards and letters into these slots for delivery the next day. I made about forty dollars that week. I gave the money to Herb for my new jacket and asked him to send it to me at school as soon as possible. We were due back at school January 4, a Wednesday. It was a brutally cold day when we disembarked the train after it slowed to a stop at the campus. I looked out of the train window to see a foot of snow covering the golf course and icicles decorating the trees. Wearing my overcoat, I got off the train and located my suitcase sitting in the snow. The wind was blowing hard and I saw Charlie Mudd's face turning pink. "You're from Chicago. You should love this." We grabbed our suitcases and ran as fast as we could across the ninth fairway for Marquette Hall where we had rooms. I hoped Herb, back in Lexington, was busy finding me some warm clothes to wear. On the way I turned to look for the coal car on the siding by the heating plant and stopped in my tracks to stare at what was a siding as empty as it was before we had left for Christmas. No coal! How could this be? "Hey, Charlie, there's no coal car! Look!" Charley Mudd stopped in the rasping wind and stood, the disbelief puckering his face. "I don't believe this. What do they think we are, polar bears?" "C'mon, I'm getting out of this stuff," I called and turned for Marquette Hall. It was slow going slogging through the snow and battling the wind at the same time. The steps up to the door of the hall had been scraped clean and when we went through the heavy glass doors we were met with yet another surprise. Inside the building was cold. No heat. "Should've known," grumbled Charlie Mudd. My room was an icebox. Without steam heat and with the window facing the direction from which the icy wind was blowing, there was no chance for warmth. I stood close to the window and looked across the golf course at the train just pulling away. "There goes the last heat we'll feel for a while," I thought. I could feel the air coming right through the panes of glass. The first thing I did was strip one of the two army blankets from my bed and hang it from the curtain rod to block the cold. The room darkened. It would be a trade off at night: blanket on the window or blanket on the bed. Which would keep me warmer? The first days back were miserable. The railroad company apparently had left Campion's coal car on a siding somewhere else by mistake and was not sure where it was. So the car with its load of precious coal was lost. The temperature outside got as low as 12 °F. And the wind never stopped raging. The only building with heat was Loyola Hall, the relatively new cafeteria that was heated not by steam from the central heating plant but with natural gas. So we spent a good deal of time there. Thank goodness there was hot water in the rooms and I would fill my sink with it before retiring. The best time of day was at night when, wearing two sweaters, I could crawl in bed under a blanket and my overcoat and dream of my new winter jacket. Then at dawn I would rise to a dark frigid room, don my overcoat and hurry over the ice and snow to kneel in the cold chapel for Mass where I prayed for sun to warm the world and for Mass to be short so I could get to the cafeteria for breakfast where it was nice and warm. Two of the distractions that took our minds off the dire situation we were in involved a Saturday evening radio program and a little bird about the size of a sparrow that had built a nest on the ledge of one of the second story windows of Marquette Hall. On Saturday nights it was our practice to gather around a radio in Charlie Mudd's room and tune in to Lucky Strike's "Your Hit Parade" to find out what popular song had risen to number one that week. Frank Sinatra and Doris Day sang the songs starting the program with number ten and ending with number one. Chickery chick is me?  . . . And so on, and so on. Didn't make any sense to me, but the song really went places. It won an Oscar as Best Original Song for 1946 and became the opening theme for Wonderful World of Disney, the popular TV program. Many artists, including Doris Day, Louie Armstrong, Johnny Mercer, Mannheim Steamroller, Diana Ross and the Supremes, and Guy Mitchell, recorded it. In 2010, the song was voted into the Grammy Hall of Fame. Anyway, all the guys knew this song. We buried the little bird in the snow, bowed our heads, one of the seniors said a few words and we hustled back into Marquette Hall to resume our shivering. About a week after we returned from Christmas vacation the railroad company found our lost coal car and shoved it onto the siding by the central heating plant and all the buildings were suddenly warm. At the same time, the winds calmed down and the icycles started dripping. Two weeks later, on a fairly warm afternoon, a package from my brother-in-law, Herb, arrived in the mail for me. It must have weighed thirty pounds. I dragged it to my room and opened it. Inside was a three-piece leather and sheepskin arctic snowsuit. It was obvious to me Herb had been down at the Army Surplus Store to buy the warmest contrivance the U. S. Army had ever concocted. There was a fur-lined aviator-type cap with goggles, a coat top with a zippered front, and suspendered leggings big enough for a polar bear. I tried it on, that is, I climbed inside it. It was stiff. Took me ten minutes. When I was inside with all the zippers pulled up, I couldn't bend my elbows or my knees because the material was so bulky and I began to sweat profusely. This would not do. There was no room in my closet big enough to hide the contraption, so I gave it to Brother Gaul to donate to some unfortunate poor person. Chickery-chick. I was thinking of the funny stories. Like the time we all had to stand on the drill field when it was bitterly cold for the ROTC morning rally. My hands were so cold that it was almost impossible to undo buttons on the uniform. In those days, the uniforms didn't have zippers. Or the time I ripped out the seat of my insulated pants after ejecting myself from a toboggan because I thought it was going to go through a fence. As it turned out, the fence wasn't there. Only the posts. Another story is when a bunch of us went down another long (1/4 mile) hill on a toboggan. I was in front and was the guy yelling out turning movements. At one point, when the toboggan was traveling quite fast, I yelled out to lean right so as to avoid a slight dip in the path. Every one thought I said left. We hit the dip and the toboggan came to a quick halt. I flew off but the feet were still within the ropes ; sore ankles for a week or so . The very last person (6th person) flew up and over everyone except me and knocked a tooth out when his mouth hit my head. Maybe the time I fell off the bench while trying to play the piano in the Music Hall. Can't remember why that happened. I was always a bit weird like that. Sometimes I would get so cold, I would sit on the radiator next to the entrance to the dining hall. I'm sure I'm not the only one who found that warmth a welcome start to the day. I remember when several classmates decided to lace chocolate candy bars with Exlax. They never did figure out why the Exlax never affected me. All fun. I learned how to play pool at Campion although the cue ball kept jumping on the floor. Billiards was my favorite game. Got quite good at it. What do you do when you reach the age of 65 and realize that your body is slowly falling apart? I wanted to stand on the North Pole and possibly begin to understand why so many explorers over the past two centuries have risked (and lost) their lives to stand on a chunk of suspended ice in the middle of nowhere. Part of the adventure was in the preparation and in just getting there. I had to procure equipment and clothes suitable for a possible minus 40 degrees, evacuation insurance that would send a plane to pick me up on the Arctic ice in case of an accident, and more insurance that would fly me from a hospital in Norway back to Detroit. I will not elaborate on my personal medical preparations for fear of boring you. 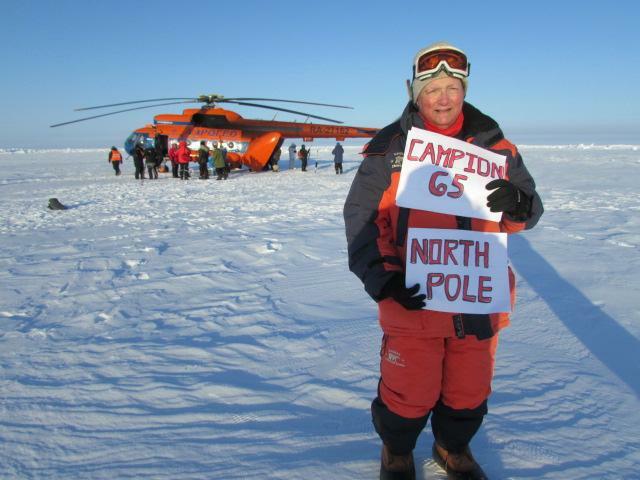 I stood on the geographic North Pole on April 10. My journey from Detroit took me to Amsterdam to Oslow to Longyearben, a tiny Arctic island mining town from where the Russians flew us seven hundred miles to their temporary floating ice camp, called Barneo, about 26 miles from the North Pole. I was fortunate in that the weather was almost perfect by Arctic standards with a clear sunny sky and temps that were estimated near a minus 20 degrees with a twelve mile per hour wind. However the thermometer at the Russian ice camp indicated a minus 50, although certainly erroneously. A guide from Italy told me that one year they encountered winds so intense they all had to hold on to a tent at the Russian ice camp to keep it from blowing away. My group was fortunate to fly back from the Russian ice camp, Barneo, Friday evening, April 12, after a stay of three days and two nights. Ours was the last flight out (or in) for the next 30 hours due to bad weather. I could still be there! I felt dwarfed by the many talented and physically strong indiviudauls I met. One lady was about to complete what she called the Grand Slam, undertakinig a twelve day cross country ski trip to the North Pole, pulling a seventy pound sled of gear over ice hillocks up to ten feet high and around open water leads. She had already climbed the highest mountains on seven continents and skied to the South Pole. One of her companions told me that he had to turn back just seven hundred feet below the summit of Mount Everest because he had pneumonia and he had run out of supplemental oxygen. One of his climbing mates, also out of oxygen, continued to the summit and paid the price with frostbitten toes that had to be amputated. I learned that just before I arrived at Barneo, they had held a marathon, one contestant requiring over 12 hours to finish. For safety's sake the course was only a little over a mile long, encircling the perimeter of camp Barneo. I was fascinated by my conversations with scientists, oceanographers, who were recording data and setting up deep water probes that would continuously relay data back to the US via satellite. The Arctic Council, an intergovernmental forum represented by the eight nations who border the Arctic, including the US, had met at Barneo just days before I arrived. Its purpose is to monitor Arctic activities and their effect on the environment and native peoples. In my group was a family of three, including a five year old boy. With two guides and a family friend, they skied the last three kilometers to the pole and slept there overnight. One of the guides dressed as Santa brought the boy a toy. He may likely be the youngest person to have slept in a tent overnight at the Pole. Two in my group were creating an art exhibit for display in Venice, Italy. 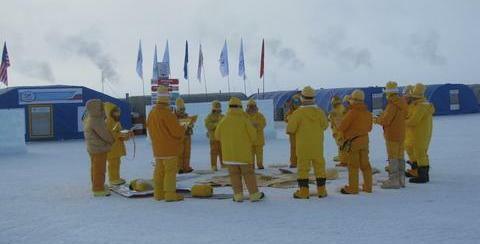 They harvested chunks of ice at the Pole which will be carved, and they made a film. Kind of complicated to fully describe what they plan to do. Up close I watched a Buddhist ceremony in front of the mess tent. There was a group of about 15 from China where they live in a monastery, all dressed in yellow, and most no more than five feet tall. They sang a hymn while rotating in a circle around a clock that I was told runs counterclockwise, and a box that contained "Chi." And just for the fun of it, my guide brought along a golf club with which we hit biodegradable golf balls. I was told about sky divers who wear special suits heated by battery packs. I met a snowmobile guide on Spitsbergen Island where the town of Longyearben, my main base, was located. He told me that there is an incident with a polar bear every year, but only about once in ten years is a human life lost. Polar bears on the island outnumber humans, 4,000 to 2,700. Three weeks earlier a polar bear attempted to climb through a window into a cabin housing two people. A hand gun prevented the couple from becoming polar bear poop. Truly amazing is the Russian floating ice camp, called Barney. It exists for just three or four weeks each April. The Russians fly over and select a floating piece of ice that must meet certain criteria, including size and thickness of the ice. Paratroopers parachute in along with a tractor or two. They build two runways for a cargo plane. More people arrive to set up the camp, which is quite impressive considering. The tents are heated and there is even electricity in the mess tent for a computer. ( No need for lighting now since day light is continuous, or so it seemed --I was asleep by 11:30 pm with full sunlight.) Sometimes a runway cracks and they must use the alternate runway. One year both cracked. Another time a tractor fell through the ice, the operator jumping off just in time. Their helicopters come from far away in Russia and have to hop scotch, using various Arctic islands for refueling en route. The polar ice cap is in constant motion, sometimes moving over one mile per hour. Therefore, within minutes after I stood on the spot designated as the geographic North Pole, I was no longer standing on the geographic North Pole.. I was reminded of what a small world we live in when on two separate occasions there I met people who knew acquaintances of mine in Alaska, where I was a school teacher before going to medical school. And how wonderful it was to have dinner with a family friend of many decades, Joanne Ag gens, the mother of Annie Ag gens, a respected Polar guide who has led groups on skis to both Poles and who is book author. You can read about her on Wikipedia. Both of Annie's parents were river raft guides through the Grand Canyon back in the early days before the dam, when the Colorado river ran warm with a muddy red color and flash flooding was unpredictable. Annie brought her small children with her to Longyearben, and guess who had the pleasure of baby sitting while Annie worked her magic-- fine tuning our trips? Longyeaben, the tiny mining town, is located on Spitsbergen Island, part of the Svalbard archipelago of islands owned by Norway, about seven hundred miles from the Pole. This was our main base. I read in a Russian publication that polar bears outnumber humans on the island. My B&B there had a small restaurant that featured minke whale and seal steaks. Of course, I had to try both and the whale meat was excellent. Longyearben has an ordinance that requires anyone leaving the town limits to carry a rifle because of the polar bears. I was told that a year or two ago a group of twenty college students were camping in tents, surrounded by a trip wire connected to an alarm. The alarm failed to go off and one person was killed before they were able to shoot the bear. The town now suggests that you also bring a dog as an early warning alarm when camping. I noted that Barneo had one large good natured husky tied outside near the tents. Much more could I write, but enough is enough. P.S. Thank you for reading this. We had asked guys who were involved with the Campus Radio Station to send in their memoirs. The following reminiscence is a bit about VOC from an insider's perspective. While I was an 8th grade student in 1955, Campion High School's radio stations were its most attractive features. On a visit to see my brother, Brownie (a.k.a. Francis Brown, 1956), who had transferred to Campion as a junior, I met Fr. Conroy, S.J., the moderator of VOC radio and of the ham club. A licensed amateur radio operator, Father Conroy took me to the pinnacle of the temple (fourth floor of Koska Hall) and showed me the kingdoms of the world (the two radio stations, VOC and his 1KW ham station, the wall of shelves filled with electronics equipment, the electronics workshop, the library of ham radio magazines) and indicated that it could all be mine if I came to Campion. Yeah, I was tempted! "Where do I sign"? Electronics was all I really lived for back then. I had passed the FCC ham licensing exam by sending and receiving Morse code at 13 words per minute and by knowing enough theory and laws of radio communication. I figured that with a man like Fr. Conroy as a mentor there was no limit to what I could learn and accomplish. When I arrived at Campion as a student in the fall of 1956, however, Fr. Conroy was no longer there. In his place as moderator of the radio clubs was a scholastic named Mr. S.J. Graf, S.J. This was great, because Mr. Graf loved electronics as much as I (even more, it seems, because I understand that he later left the Order to return to Redwood City, CA to work in electronics). So, except for occasional forays into Latin, Algebra, history, chemistry,music, sports, etc., I spent much of my Campion years with the other nerdy radio boys behind the double doors at the top of Koska Hall (or on the roof, fooling with the antenna). Many of my fond memories of Campion involved the hours spent dreaming of future applications of electronic communications, maintaining the VOC equipment with Mr. Graf, assembling radio equipment, studying or conducting ham radio with my friends, or reading QST, the amateur radio magazine. After Mr. Graf left the faculty (1958, I think), he was replaced by Mr. Howard, S.J., who doubled as my Latin teacher. Unfortunately (to my mind, at the time), Mr. Howard, a Holy Cross graduate, was more interested in campus broadcasting than in technical electronics. He proceeded to encourage me in public speaking, but occasionally drafted me to help with VOC broadcasting and electronic maintenance. Mr. Howard's influence diverted me from becoming a Steve Jobs into uncharted territory called "Liberal Arts Education" Maybe we will consider that another day. Many other knights were involved in the Voice of Campion between 1956-60 as announcers, engineers, and electronics nerds. I particularly admired John Schweiters, a particularly gifted broadcaster and wonder what ever happened to him. John Cowgill, William Franklin, and William Parazin, and Anthony Rudis from the 1959 class were some of them, as well as Vincent Chiara, George Silvestri, John Leatherman, John Diamond and James Havranek from my class of 1960. I worked at the VOC radio station while I was a student. I really don't recall much about it though. I remember helping out some nerdy engineer guy. I don't remember what I did or if I was also a DJ. I'm pretty sure it was in my freshman year, but don't remember if I worked there longer or not. That's not much information, but you can add that to your research. I'll continue to think about it and see if I remember any more. I worked at the radio station while at Campion from about 1971-1973 when I graduated-actually was the sort of manager at one point-the station was in the basement of Xavier and operated mostly late afternoon and night and on weekends-as I recall there was a mostly top 40 format in the early hours changing to more album new wave in the later evening. Also recall we sold some ads to local merchants-I think Farrell drugs Ma's and the bakery? Others I remember involved from my class of 73 were Eric Hillebrand Jeff Turner, Pete Norton, Jay Gleeson, Gerry Rumella, Pat Wehner, and others I just can't recall. I worked at VOC '59-'60. Fr. Wiggins recruited me to do a half-hour evening classical music spot on Saturday nights. Not much of gig, just selected a vinyl with a classic I knew about 20 minutes long, read the liner notes over the air, spun the disk. Fr. W may have taken me off the schedule in the spring of '60. Goofy old studio in the high attic of Koska Hall. I remember the VOC studio on the 4th floor of Kostka Hall. I DJ'd there as an upper div sophomore spinning 45's and chatting about campus events. The most fun I had was travelling with the basket ball team as a senior (non-player) and doing a remote-live play by play of the game over a telephone hook-up that was broadcast to all the public areas that had speakers on the campus.This was in the day that professional baseball broadcasts were being done by ticker tape, we were ahead of the curve. I did this twice and then the phone charges caught up with us.As far as the site of the transmitter I thought the whole thing was in Kostka Hall, however the "engineer" at that time was Joe Zorc '57. I worked at VOC in 59 & 60 part time as a DJ, playing mostly Jazz & R&R. The administration did not favor the most raucous stuff and especially frowned on "Rebel Rouser" by Dwayne Eddy. Bob Sackerman and I snuck that in whenever possible. Today it's a "classic" and the school is closed. What can you say? 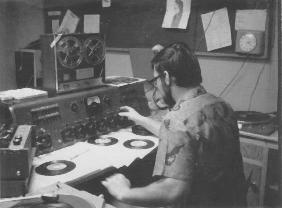 After, VOC and Kostka Hall burned down, Tom Lundy '72 spear headed a venture to replace the radio station. We were given a room in the basement of Xavier Hall (seniors dorm) to use as the radio station. Tom, Larry Dunn '72, and I took a trip to the Quad Cities and scored a vintage 1942 RCA radio station control console. Mr. Dagnon was our chauffeur. Somewhere we obtained a couple brand new state of the art DJ Turntables. Reel-2-Reel tape decks were on loan from various students. When it came to the question of how to transmit the signal we found a technology called Carrier Current Transmission. It was basically a low power transmitter that sends the signal throughout the building using the Power Lines as the antenna. These days it would be similar to the BSR X-10 home controllers. Doing it this way we didn't need a FCC license. It took some finagling to get Bro Staber to agree to hook these pupplies up to the breaker boxes in Xavier Hall and Lucey Hall. To get the signal to Lucey Hall a coax cable had to be run through the steam tunnels. I didn't mention Marquette Hall as in 1971/2 it was a vacant building used to house girls when they were bussed in for special GO CO-ED weekends. The radio station somehow got christened WZAP. I don't know why we didn't keep the VOC callsign. I thought it was appropriate though because I did get zapped while rebuilding the console. One of the capacitors was holding it's charge extra long and I didn't discharge it long enough before poking around. One day, someone layed on me a black box that I think I remember that they thought it was the transmitter from the VOC station in Kostka Hall. I thought all equipment burned down with Kostka Hall, so it could have been another salvaged item we picked up somewhere in our endeavors. It didn't work well, and rather that throw it out, I kept it for a few years thinking I might get it to work again. But alas, I eventually gave it away to another Radio Engineer. Recently, it has been suggested that the transmitter for VOC was located in Campion Hall and not Kostka Hall, thus it would have survived the fire. But I also have conflicting information. I sure would like to know for sure. Kevin Havlik's status report indicates that the transmitter was from Marquette and Lucey Hall Stations. What stations were those? Were those connected to VOC in Koskta Hall, or were those separate stations. Who knew, that decades later, I would be interested in the history of Campion stuff. I wish we still had it, if in fact it was the actual VOC transmitter. You can read the status report Kevin Havlik '72 wrote in December of 1971 here. More pictures and info about WZAP (VOC 2.0) Radio Station. My understanding is the next year after we graduated the new guys from the class of 1973 renamed the station to something else. I would like to know what that name was for the record. Alumni who have passed in 2012.